When people think of businesses using social media to their advantage in a creative and beneficial way, the construction industry isn’t typically the first realm that people think about. In this age of rapidly changing technology, it’s time to adjust that mindset in the industry and think of social media as a strategic and extremely relevant online marketing tool. Having social media business pages is a crucial element of any business strategy. No matter what the age range or technical capabilities of the target audience, there’s no denying that Facebook has 2.23 billion users. Currently, the construction industry leans toward an older demographic so social media isn’t deemed a priority for reaching them. 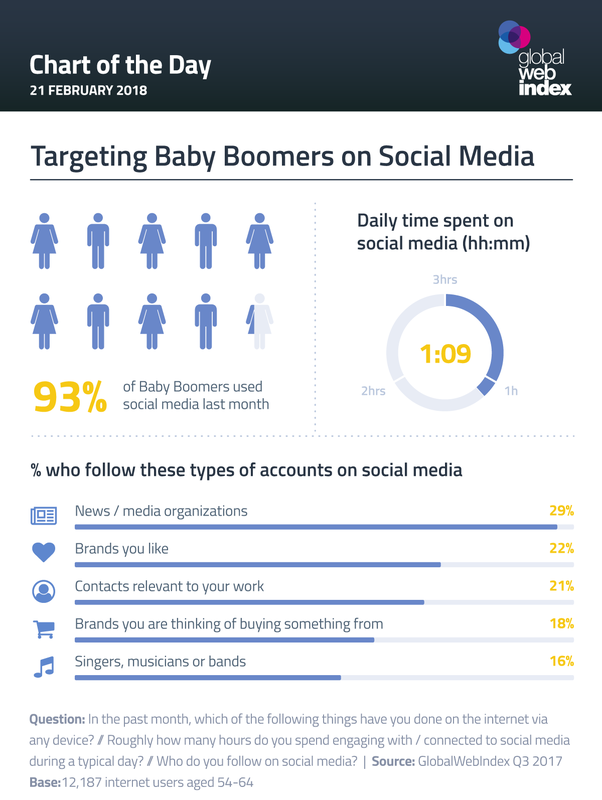 However, according to this infographic from Global Web Index in February 2018, 93 percent of baby boomers used social media in the previous month, spending a total time of one hour and nine minutes on the platform. If businesses still aren’t convinced, here are some additional statistics on social media usage by consumers that might strike a cord. More than one in three Internet users say they go to social networks when looking for more information about a brand or product, according to Insight Global. There are now more than 50 million small businesses using Facebook pages to connect with their customers, according to Adweek. Almost 90 percent of marketers say their social marketing efforts have increased exposure for their business and 75 percent say they’ve increased traffic, according to Social Media Examiner. Executives who think social media isn’t necessarily revenue producing may want to think again. However, revenue should not be the sole focus when creating a social media strategy. There are many other ways this type of platform lends itself to be a strong business asset. Viewing it as only having potential to produce direct sales is the wrong mindset to have. Here are some other important ways social media can impact the business. Social media helps build a stronger relationship with the customer. Often, it is a more informal and fun approach to the business, portraying a more casual tone and providing the customer a more relaxed way to get to know the company. A great way to offer another look into the business and values behind it is its community interaction. If the business participates in a local community day, highlighting this often takes place on social media and is a good way to showcase the business’ dedication to benefiting its surrounding community as well. Social media fosters long-term relationships with the customer land builds trust between the business and the consumer. A great way for businesses to do this is by posting related industry news to keep followers informed about the latest events. Not only does this make the business a trusted resource, but it also shows customers the business understands and monitors the kinds of news and changes that impact them. Social media platforms such as Facebook also offer customers the ability to leave reviews. Businesses should encourage past and present customers to leave their thoughts on the companies’ Facebook pages for future customers to see. This also provides prospective customers with another level of transparency in being able to view customers’ real thoughts about the business. As social media has evolved from just keeping in touch with friends, it’s also begun to lend itself as a customer service tool for businesses. If customers have difficulty reaching a business in the more traditional means such as phone and email, customers’ next step is to tweet or direct message a business account on social media. They often find more real-time responses, which has supported this trend of reaching out less traditionally. A variety of business pages on Facebook are enabling chat capabilities that will automatically pop up when a user visits the page, which encourages direct communication—a huge benefit when trying to connect with prospective customers. Social media can be a useful tool in nurturing new and existing customer relationships. It’s about creating value and focusing on the relationship-building element, which comes with potentially lucrative results. This should be at the forefront of business’ minds when looking at social media as a strong asset. Businesses using social media offer a great way to ensure customers stay connected and engaged, ultimately making their business thrive even more.